The Ton and Chibitronics Blog Hop! Good Morning! Welcome to the Blog Hop for The Ton’s collaboration with Chibitronics! You should have arrived from Eunji’s blog and your next stop is Mayline’s blog. My hubby is an electrician. He is pretty much awesome with anything with wires and circuits and lights… And I most certainly am not. I will be the first to admit that I am a bit of a dunce when it comes to anything electronic… My smart phone is most certainly smarter than I. (I know, I know, I’m a milennial, so I”m supposed to be more capable than this with my electronics.) So when the collaboration between The Ton and Chibitronics was announced to the Design Team, I was just a tiny bit (ahem, A LOT) nervous that I wouldn’t be able to figure it out. I thought to myself “oh, I will just ask my electrician hubster for help if I need to,” which helped me relax quite a bit. BUT! I just sat down with the handbook that comes in the Chibitronics Starter Kit, watched a few videos, and just played with it, and I was able to figure it out all by my lonesome. Yippee! It sounds so intimidating, but the manual really breaks down the technical terminology into useable bits that actually make sense. I am all for dumbing things down in when it comes to technology LOL! I created the circuitry based on the instructions found in the book that comes with the Starter Kit. I used the holes in the front panel as a guide to determine my placement of the LED lights. It took a couple of practice tries, but I finally got the copper tape in the right spots to create my circuits! The key (for me anyway) was that I needed to keep my tape closer together to make certain that the LED lights could touch the positive and negative tapes on both top and bottom of the LED stickers. After I made certain that the lights would actually light (YESSSS! ), I cut up some fun foam to use to pop up the card base so the battery wouldn’t be an unsightly lump at the bottom of the card haha. Wow! Your card IS awesome! That purple background is gorgeous, and the combination of silver ink and lights make the card glow. I'm in love! The card looks like a dream. Beautiful colour and the tiny lights brings it to life. Love this and congrats on being able to figure it out all by yourself. So pretty, I love how the stars light up. What a great project I would love to try a card that lights up,so cool. OMG, gorgeous background for the lights! So pretty! The combination of purple and silver is very gorgeous! I love the color, your design, your card is perfect!! Love yourbackground and yourcolor choices. Fabulous colors! Love this card with or without the lights, but they are a nice enhancement. 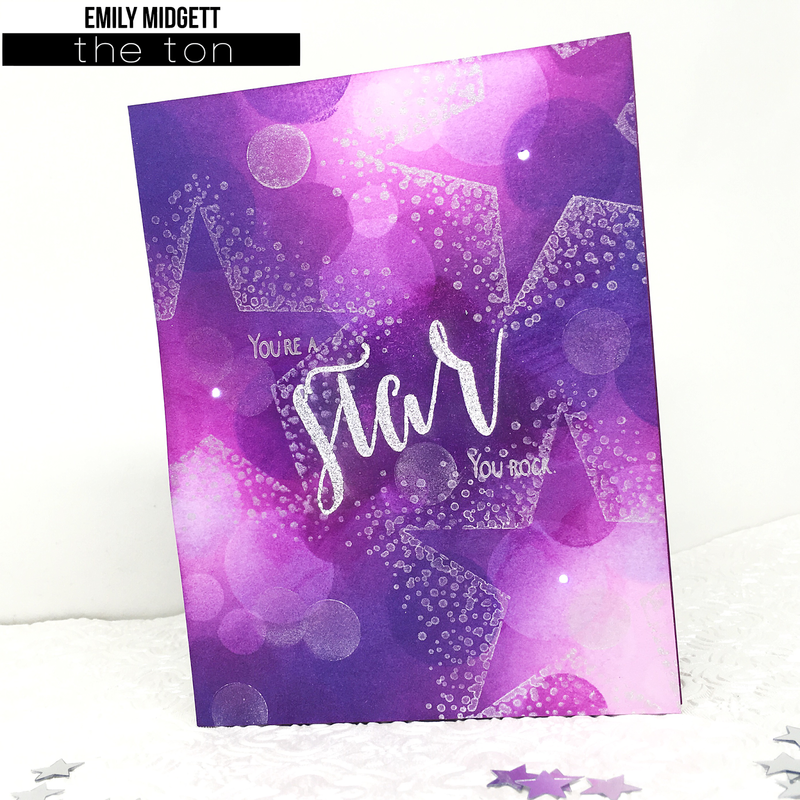 What a beautiful cards, I love your colours (purple and silver is one of my very favourite combinations) and the addition of the lights is so fantastic! Amazing card!!!! The bokeh affect is amazing! absolutely gorgeous card – so elegant! This is gorgeous, and you are right, a christmas card would look amazing with these twinkly lights!!! So fabulous!!! I have been eyeing the Chibitronics for awhile now and I just adore what you did with your card! What innovation! Congrats on making this seem doable for all of us! 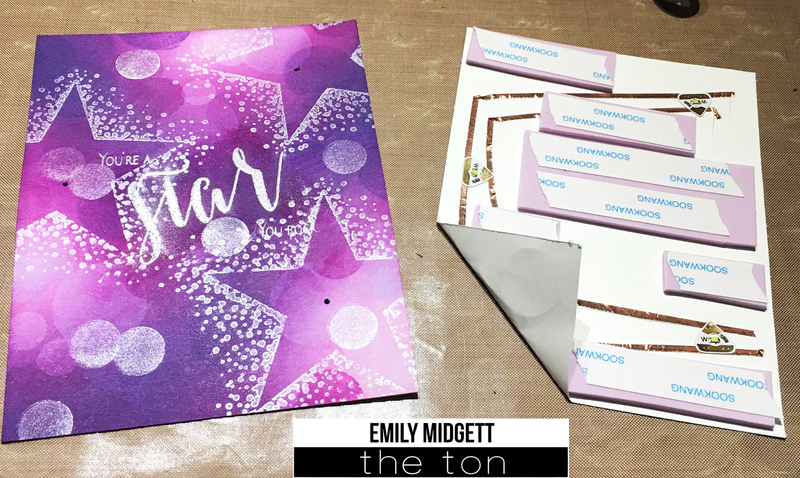 Pretty color combo and stars on this beautiful card! Love the addition of the lights! Wow!! This is lovely!! Beautiful blending!! Love that it lights up!! Gorgeous card! Love the colors, the bokeh, the stars, and those lights! It's just beautiful! Wow! What a stunning card!!!! Love it! Oh my Emily, that is one beautiful card! And no, I haven't tried this yet but it looks like a fun way to make an interactive card! Wow, stunning card. Love the color! WOW! This fabulous! Those lights are amazing! Beautiful!! Thanks for sharing all the tips on making this fab card. Your background is awesome & I LOVE that stamp! Can't wait to try these awesome lights! Beautiful card and I love the purple! SO much fun with the lights and the star is perfect! Hi Emily ~ Your card turned out FANTASTIC!!! 💜 all that purple!! I've also been afraid to try these little lights too but they add such a fun element! Thanks for sharing!! Love how you paired the star theme with the lights! Such a pretty card!! 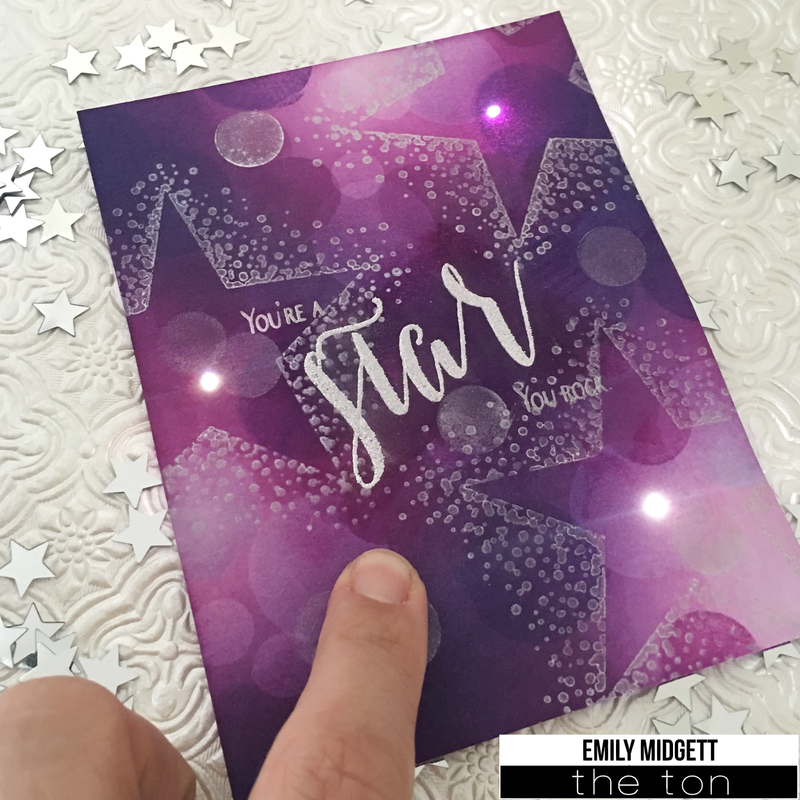 Love your card, all that purple with the stars is pretty. The lights are so cool.